Saturday September 8 2012 - 2:30 ‘til 9:00 p.m. 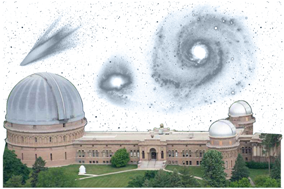 Please join us for a relaxing afternoon and evening at historic Yerkes Observatory to learn how Yerkes Outreach Educators have incorporated STEM into their classrooms. An overview of some of the authentic science experiences you can bring to your classroom by attending workshops will be presented by Stars at Yerkes Outreach Educators. Receive an orientation to our historic observatory. In the evening, we invite you to bring that old telescope that’s been lurking in the attic and we’ll help you set it up and train it on Mars! Register NOW for this fun orientation to our new year of learning. Click here to register.